That said, I did make use of an excellent series of small books that formed the foundation of their independent reading—it’s called Now I’m Reading!—and I recommend it very highly, if English is your target language, too. 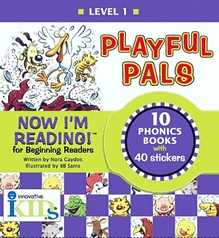 Now I’m Reading!, written by elementary school teacher Nora Gaydos, is a program for beginning readers that consists of multiple sets of small books—books that combine the best of phonics and literature. Because programs of this sort often emphasize phonics more heavily than literature, resulting in stories that are thin or nonexistent, such programs can be dull and a drudge for both parent and child. It isn’t easy, of course, to create engaging stories from a very limited list of words, but Now I’m Reading! does this remarkably well through its lively humor and silly illustrations. 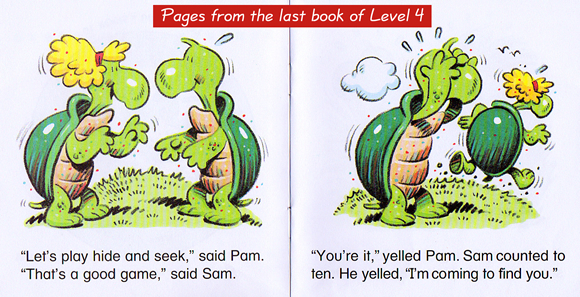 Not only do the books provide a solid grounding in phonics and sight words, they’re actually fun to read. The Now I’m Reading! materials continue to evolve, but when I used them with Lulu and Roy, these were the sets that formed the core of our daily reading practice. Each level consists of 10 small books—10 pages per book—that come snuggled in plastic pockets inside a book-like case. Lulu was 4 when we began using them, and Roy was 3, and after about six months, and 50 books, they were reading independently at the sort of level you see below. The Now I’m Reading! sets come with a helpful “parent guide” as well as a sheet of “incentive stickers” to mark progress. For more information on these books, and other materials in the Now I’m Reading! family, see this page from the publisher, Innovative Kids. You might also be interested in the author’s blog, though it hasn’t been updated for a while. How about you? What materials have you used for beginning readers of English? Let me express my gratitude for your web-site and this review in particular. We’re raising our bilingual in Russia (both of us native Russian) and no doubt the kid’s English language skills can’t be compared to his peers’ in English-speaking countries. But that’s better than nothing, right! He’s just turned 3 and the books you recommend come very handy. Anastasiya, welcome! Thank you for your comment. I’m really glad to hear that my site is helpful to you. I wish you and your family all the best on your bilingual journey. Just keep up your efforts to promote your son’s English, day after day, and his language ability will grow over time and ultimately benefit his life in many, many ways. I’m cheering for you!